Back cover blurb: She used to work for the U.S. government, but very few people ever knew that. An expert in her field, she was one of the darkest secrets of an agency so clandestine it doesn't even have a name. And when they decided she was a liability, they came for her without warning. Now she rarely stays in the same place or uses the same name for long. They've killed the only other person she trusted, but something she knows still poses a threat. They want her dead, and soon. When her former handler offers her a way out, she realises it's her only chance to erase the giant target on her back. But it means taking one last job for her ex-employers. To her horror, the information she acquires only makes her situation more dangerous. Resolving to meet the threat head-on, she prepares for the toughest fight of her life but finds herself falling for a man who can only complicate her likelihood of survival. As she sees her choices being rapidly whittled down, she must apply her unique talents in ways she never dreamed of. Truth is – I’m not that into Vampires... However, when I heard about this novel, I knew I just had to read it. 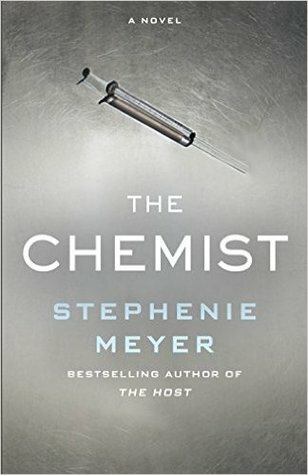 The Chemist is mainly told to us from Alex/Juliana's perspective. A highly intelligent woman who was previously used and abused by the US government, forced to use her medical skills for something much more sinister, she is glad to be away from that world. When a former colleague approaches her and enlists her help, she is reluctant. Last time she worked for the government they almost got her killed. But when it appears that US National Security is threatened Alex knows that she must put her own fears aside and once more prepare to do as she's told by the government. What she doesn't prepare herself for is the prime suspect being targeted being nothing like she imagined. He is no monster. Have they sent her in search of the wrong man? Or is there something even bigger at stake? The Chemist is an enjoyable read and I hope that Stephenie Meyer continues to write in this genre. The Chemist is available to buy now via Amazon online and all good book shops. Thank You to the publishers who sent me an advance proof copy of this novel in exchange for an honest review.